Planning to exit your business is a big undertaking that has implications for your business structure, its assets, your employees, and your tax obligations. Whether you’re retiring, selling your business, or going through bankruptcy, you will want to develop an exit plan with your lawyer and a business valuation expert. Business exit planning is sometimes called business succession planning. Exit planning helps you maximize your financial return and minimize your tax liability when you transfer your business. Also, if you pass away or become disabled before you retire, exit planning will help the business survive your departure, enabling you and your family to receive its full benefit. Succession planning relates to relinquishing management responsibilities. When do you plan to leave your business? How much money will you want or need when you leave? Do you plan to transfer ownership to insiders or sell your business to outsiders? How much is your business actually worth? Will the value support goals and objectives for exiting the business? How do you find the right buyer? 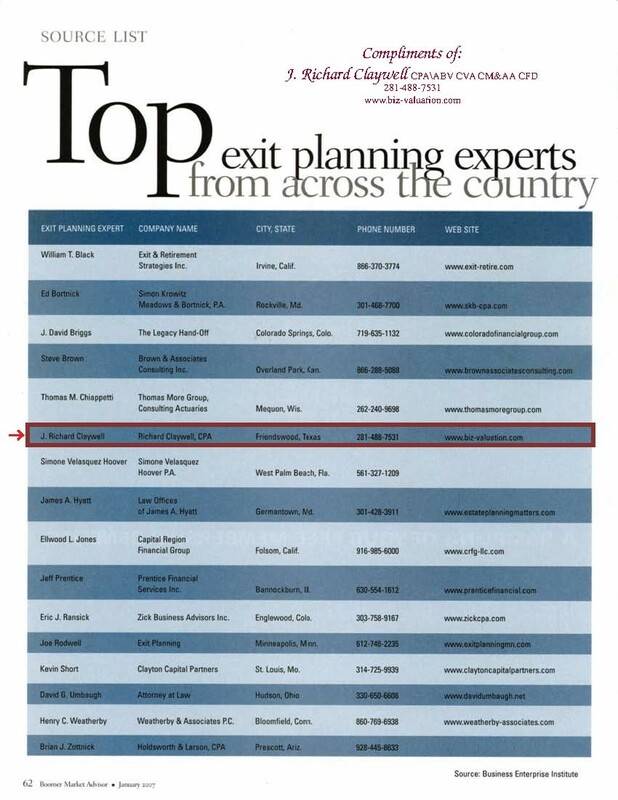 Boomer Market Advisor January 2007 named Richard Claywell in “Top Exit Planning Experts From Across the Country”.